Introductory flyer from Barbara Smyth, Independent Republican in Longford/Westmeath. She is Longford based and previously ran for Sinn Féin in the Local Elections. From the 1954 General Election in Sligo/Leitrim a flyer for Joseph Pilkington an Independent Republican Labour Candidate, Workers Unemployed, Small Farmer and Old IRA candidate. He polled 2,710 votes and failed to win a seat. As far as I know Pilkington was a Sligo Town based Councillor. He was elected to Sligo County Council and Sligo Corporation in 1950 as a Labour candidate and died in 1955. I don’t know why he didn’t stand for Labour here in 1954. 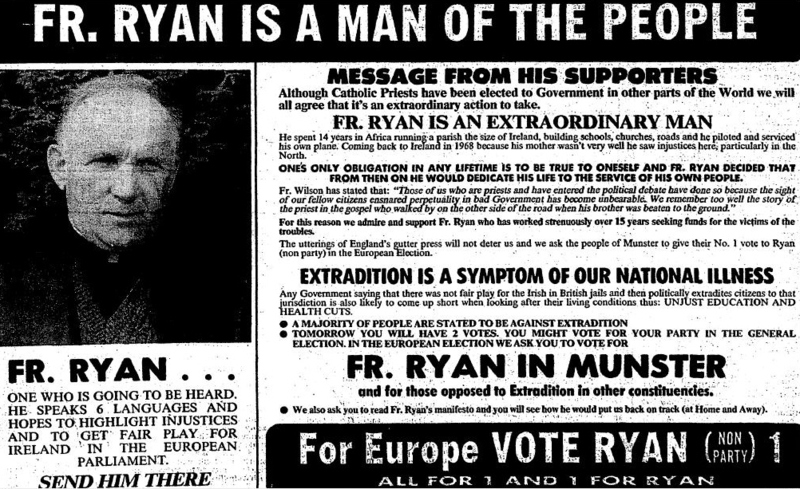 From the 1989 European Elections Father Paddy Ryan an Independent Republican running in Munster. Father Ryan was subject of an extradition request from Britain which was denied. He polled a respectable 30,934 votes but failed to win a seat. A Leaflet from Independent Republican (and prominent 32 County Sovereignty Movement member) Gary Donnelly running for a seat on Derry City Council in the 2011 Local Elections in Northern Ireland. He ran in the 2005 Local Elections polling 493 votes (8%). Amongst the issues raised in his leaflet are Derry being the UK City of Culture, A Fair deal for local workers, especially Taxi drivers, The PSNI and Political Prisoners. He was recently arrested in connection with the murder of Denis Donaldson. 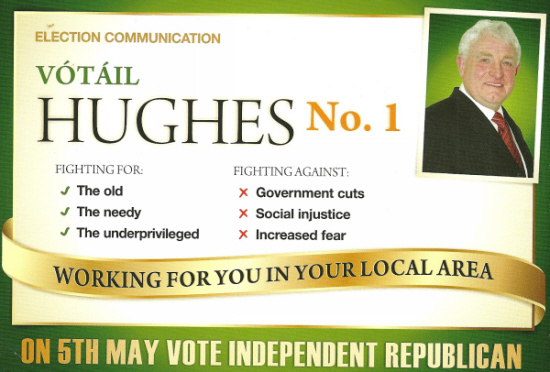 From the 2011 Local Elections in Northern Ireland a leaflet for Independent Republican Party candidate Oliver Hughes who is standing in Moyola. Oliver Hughes is the brother of IRA hunger striker Francis Hughes. Hughes was originally elected for Sinn Fein but has since left the party. Another former Sinn Fein Councillor Patsy Groogan is also standing for the Independent Republican Party in the Sperrin ward of Magherafelt DC.